Unlike other supplements on the market, developed for joint health, that try different combinations of ingredients, Kirkland Signature™ Glucosamine with MSM Joint Relief focuses on just two: glucosamine and methylsulfonylmethane. While this sounds like a barebones formula, the product seems to be enjoying a lot of positive reviews from users who say that the product is really helpful in reducing pains in the joints and making them more flexible. Since positive feedback is a good argument in favor of any product, we decided to review it here so you can make your choice, based on solid information. These figures are for one serving, or two tablets. As you can see, there are no other ingredients included except these two and a few extras for coating. Since the product does not contain hyaluronic acid or chondroitin sulfate, it may not be as effective as other health supplements made by competitors. The manufacturer recommends taking two tablets daily, for best results. Since the product contains shellfish, you may want to consult your doctor, in case you suffer from allergies, to prevent any mishaps. A bottle of Kirkland Signature™ Glucosamine with MSM Joint Relief with 375 capsules is priced at 17.99USD, which is an incredible price, but also makes us wonder if it is too good to be true. While the official website states that 90 day refunds are offered for certain products, it is unclear if the same policy applies to health supplements, as well. Kirkland Signature™ Glucosamine with MSM Joint Relief is based on a very simple formula that consists mainly of just two ingredients, glucosamine and MSM. While the two are well known to provide important benefits for joint health, the lack of hyaluronic acid, chondroitin sulfate and herbal remedies is not that great a sign. 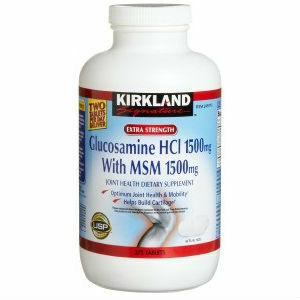 Mark Stevens	reviewed Kirkland Signature™ Glucosamine	on December 29th	 and gave it a rating of 2.5.